With Manchester United’s comfortable victory over Fulham moving them to 6th in the table, FOX Sports Asia takes a look at the major talking points from the game at Old Trafford. 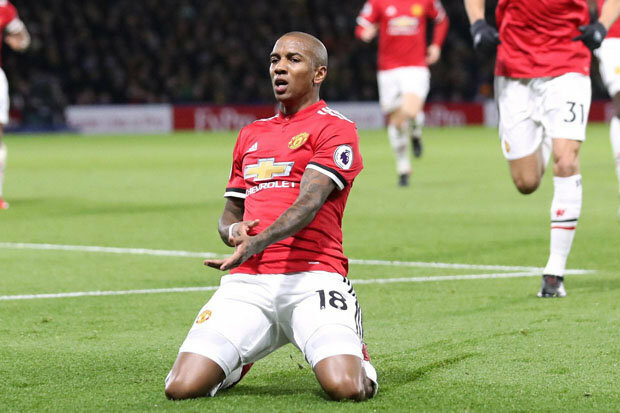 Despite apprehensions about another dour display by United at home, Old Trafford was in full voice as the game started and stand-in skipper Ashley Young gave them even more reason to cheer, bending a curler into the far side of the goal only 13 minutes in. What was even more impressive was the way Young went about the game, beating his man on the touchline time and again while his tackling remained as hard as ever. Perhaps told to curb his tendency to cut onto his right foot every time, Young ran riot – adding variation by putting in quality deliveries with both his left and right foot. Indeed, this was a vintage display from the captain and reminiscent of Young at his peak, even managing to nutmeg Odoi for his goal at the beginning of the match. As the team sheet came rolling in, the omission of one man from the starting line-up made headlines yet again – Paul Pogba dropped for the second time in three days. One wondered where the creativity would come from in this United team and it was Juan Mata who stood out for the hosts in this department. So often in and out of the team, Mata’s inclusion certainly felt like the missing piece of the jigsaw for Mourinho’s side as they played with a flow so often lacking this season. He scored United’s second of the night with a finish through the legs of a Fulham defender and could’ve added an assist to his tally too, if not for Ander Herrera’s profligacy in front of goal in the second half. All said and done, Mata undeniably added some much-needed gloss to United’s attack and more than filled up the void left by Paul Pogba’s absence from the starting line-up. Praised in the aftermath of the draw with Arsenal by his manager as being ‘special’, Marcus Rashford repaid his manager’s faith with yet another masterful display at home. Linking up beautifully with his fellow attackers, Rashford added to his assists tally with a neat cut-back for Juan Mata to score United’s second goal of the match. Flowing with confidence following United’s second, he tried his luck with a free-kick from 35 yards out, forcing the Fulham keeper into a smart save. The youngster showed tenacity too, continuing to hassle the Fulham players in the second half despite United being three goals up. He finally got his reward in the second half, rifling a shot into the near post, having spotted the Fulham goalkeeper slightly out of position and Jose Mourinho duly afforded him a well-earned rest, as he went off to a standing ovation from the home crowd seconds after scoring. One of the recurrent themes in Jose Mourinho’s past two press conferences has been him lamenting the lack of ‘mad dogs’ in his squad, a phrase coined by the Portuguese to indicate that his side lacked players with bite, with Ander Herrera and Marcus Rashford the only ‘special’ players according to him. His want for such players was answered in the game against Arsenal, United making more high-intensity sprints than the Gunners, and it was something that was once again evident today. From the off, the United players hassled and harried Fulham at every opportunity when they had the ball – Diogo Dalot the latest addition to the list of ‘mad dogs’, making his way forward time and again while at the same time fulfilling his defensive duties ably. His tackles were inch perfect and he could’ve had a hat-trick of assists but for the wastefulness of United’s forward line in scoring from his devilish deliveries. One of the most embarrassing statistics for United this season had been their negative goal difference and the Red Devils put that worry to bed by scoring four goals against the worst defense in the league. The Red Devils ran riot and scored three goals in the first half itself – Juan Mata, Ashley Young and Romelu Lukaku all getting on the score sheet – the Belgian scoring at Old Trafford for the first time since March. That wasn’t all as Rashford added a fourth as well – the first time United have scored four in over a year. The scoreline could’ve been even worse but for some poor finishing from the home side in the second half against 10-man Fulham, Anguissa seeing red for a foul on Rashford shortly after Fulham converted a penalty to ensure that there was no late revival from the away team.